The online backup service IDrive today announced that it is going beyond only backing up your data and is adding a sync feature to its lineup that will automatically keep files on different machines up to date. The company says this essentially doubles the online storage space available on IDrive, as every paying user now gets as much sync space as backup space with their accounts. Plans with 300GB of backup space and 300GB of syncing space, for example, start at $49.50 per year. Until now, these plans only included the storage space for backup. Backing up a terabyte of data (with an additional terabyte of syncing space) will cost $149.50 per year. New users who sign up now can get IDrive’s terabyte plan for just $1 for the first year. Given that many users may want to back up the same data they sync, though, they may not actually see their available space doubled with these plans. IDrive tells me that its internal tests showed that separating backup and sync into two buckets enabled better performance on its systems and makes it easier for users to allocate their data with those two separated. Chances are, though, that many users will want to back up the same data they also want to sync between different computers. 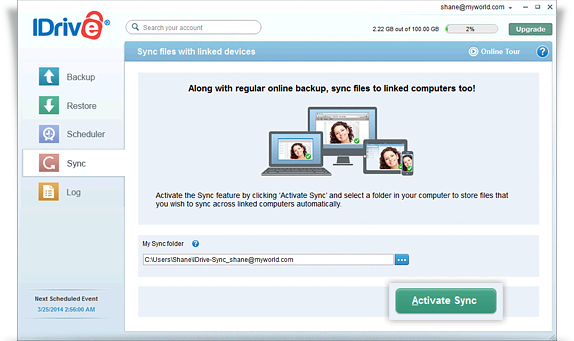 Using IDrive’s desktop and mobile apps, users can choose which computers to link to their accounts and from then on, the service will handle the rest. Users can also use the service’s web interface to upload files to their sync space, which will then be automatically distributed to all synced machines. As for the syncing feature, IDrive tells me that just like its backup service, the focus will be on security. All of the data is encrypted client-side using 256-bit AES encryption with an optional private key. That’s a pretty unusual security feature for syncing services but adds an extra layer of security.